Not your grandma’s collards, this stir-fry recipe is a quick way to enjoy greens that preserves their abundant nutrients. Serve with a piece of cornbread and a glass of milk for a complete meal. Trim all stems from collards. Triple wash. Bunch washed leaves together, roll tightly and cut crosswise into thin strips. Heat oil in large, heavy skillet over medium heat. Cook onion, stirring until lightly brown. Add garlic and broth to skillet. Bring to boil then add collard strips by handfuls, stirring continuously. 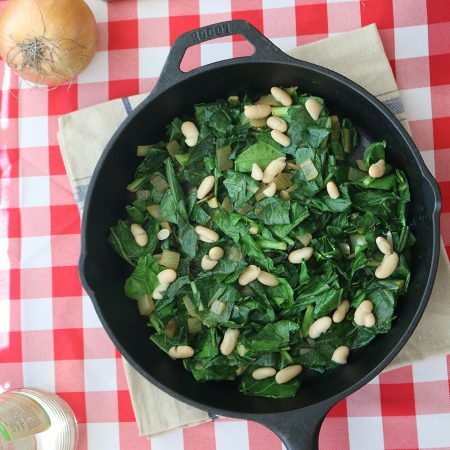 As greens reduce in size, continue adding greens until they all fit into the skillet. Cook until greens are soft but still maintain their bright green color. Stir in beans. Heat through. Add vinegar to taste. Serve hot. Enjoy! Time-saving tip: prep fresh collards and chop onion a day or two in advance or have kids help tear leaves from stems. Reduce sodium further by using water in place of broth. Kale or spinach can easily be substituted for the collards.